And now for something that you never expected to see on this blog: A defense of the Yated. After the passing of Elie Wiesel, the Yated published an article by Rabbi Yaakov Feitman in response to the obituaries that appeared in the general media. I saw responses by several people, describing it as "vile," "sickening," and unacceptably "judging him." Yes, Rabbi Feitman did take issue with some of Mr. Wiesel's theological statements, which are being amplified in the media. But he made it as clear as one possibly can that he was disputing the statements, not criticizing the person. What is the crime in that? I can only think of two reasons why people would react so strongly to Rabbi Feitman's article. Perhaps Elie Wiesel was such an icon that some see it as unthinkable to dispute anything that he says. But surely such an approach, of idolizing certain figures to the extent that it is unthinkable to disagree with them, is exactly what these people criticize with regard to charedim! Alternately, perhaps these people have a knee-jerk reaction to criticize anything in the Yated. That is unfortunate. "The Alter of Novardok offered a moshol that everyone who has ever learned Torah seriously will instantly understand. When we learn a sugya, a section of Gemara, and then look it up in the Rambam, we sometimes discover that the Rambam does not seem to follow the conclusion of the Gemara. This requires analysis and explanation, and sharp Talmudic heads work hard to “answer the Rambam.” No one would simply answer that the Rambam forgot that sugya or page of Gemara. Neither would any Torah scholar think for a moment that the Rambam was simply mistaken. The brilliant scholars of the past eight centuries have always been able to find a solution to these problems." As Rabbi Dr. Marc Shapiro demonstrates at great length in Studies in Maimonides and his Interpreters, this is sorely inaccurate. The brilliant scholars of the past eight centuries who answered that the Rambam indeed sometimes "forgot that sugya or page of Gemara," or was "simply mistaken," include Raavad, Sefer HaChinnuch, Rivash, Tashbetz, R. Yosef Caro, the Vilna Gaon, Rav Yaakov Emden, the Netziv, and countless others - including Rambam himself! If you want to provide a mashal for God's infallibility, it's not a good idea to use a human being. Side point: In the article Reb Feitman justifies the use of the term Churban Europa as he knows people don't like it. I also don't like it but I'm not sure why? Maybe because it is just so davka. I think "davka" too. That and the charedi push that "it's all about the Churban Bayit." Which I don't necessarily disagree with, but that in and of itself is pretty much a "davka" to Yom HaShoah. Also I think the Europa bit, 100's of 1000's of Jews still live in Europe, I should know I'm one of them. Rabbi Feitman is using the fact that Rav Hutner zt"l's preferred term was "Churban Europa" for cover. He is also virtue signaling, proclaiming his group loyalty, and daring listeners to take exception. This is much the same sort of thing as certain American Southerners' usage of "the War of Northern Aggression" instead of "Civil War;" that usage also includes a certain sort of hostile jesting as well and, especially when used in the presence of non-Southerners is, (though masking it with "just kidding") verbally aggressive. When Rabbi Feitman davka writes "Churban Europa" in this context, he is also being deliberately ahistorical: During most of the last half of Rav Hutner's life, the Chareidi preferred term "Churban Europa" was a somewhat viable competitor for acceptance with "Holocaust." Elie Wiesel, of course, used "Holocaust." Davka. No wonder you don't like it. I don't understand the דיוק about saying "Churban Europa"--he uses the word "Shoah" later in the article. Yehudah P it was the fact he used Rav Hutner to justify it that's all, think of it like a boich kashe. Using a human as a mashal for God's infallibility is an example of the avodah zarah inherent in Harediism. They worship several gods: the Real One plus at least one human. I once read that, even though the Rambam made the Mishneh Torah as הלכה פסוקה without the reasons or sources, he later regretted it when people asked him from where he derived a particular halachah and he couldn't recall the source. That is apocryphal, or you are confusing it with a story that Rav Hutner told about when he asked the Chafetz Chaim for the reason for a ruling in Mishna Berura and was given that response. It is on page 209 of the Sefer Hazikkaron, and he writes that the Chafetz Chaim told him "בשעת מיר העבין געשריבען, האבן מיר גוט דורכגעטאן). I think you leave out another possibility: We are naturally feel a little revulsion at anyone who judges Holocaust survivors in any (or most) ways. Eli Wiesel saw children being murdered. Feitman did not. (Of course, we see children murdered even today, but that's a different, if related, story.) Even more so, Feitman doesn't even seem to think that questions of someone who saw children being murdered should be mentioned, let alone addressed. To put it Biblically: Feitman is basically playing the part of Iyov's friends. Do you know how that book ends? God Himself appears and tells the friends to shut up. If Moshe Rabbenu himself had no answers, then neither does Feitman. And neither, of course, did Elie Wiesel. But that was part of the whole point. If anything, it's remarkable that Wiesel kept his faith in God and remained a religious Jew. That's an obituary that could have been written. But Feitman decided to be defensive. Now, if another survivor who witnessed these horrors and experience these losses, like the Klausenberger (who gets mentioned here) or R' Menashe Klein (Wiesel's chavruta and good friend to the end) wanted to raise this, then maybe we'd feel a bit less revulsion. But you know what's interesting? Actual survivors tend not to do that. Who knows, maybe they even agree with Elie Wiesel. But he's the one who wrote about it. By the way, we can say the same in the opposite direction: If someone like Yitz Greenberg wants to argue that God (rachmana litzlan) no longer has a covenant with us because of the Holocaust, a lot of us may well have the reaction of, "You didn't live through it. This isn't your place." Again, he can think that all he wants. But let's hear it from someone else. And again, oddly, actual survivors tend not to talk that way. I read "Night" as a young kid and was told it's "problematic" at the time. Of course it is. My faith survived, as did that of lots of other people. I think the real problem is that Feitman fears that if his community reads "Night" (or whatever other book that raises tough questions), they'll abandon Judaism altogether. And there's a real problem. Charedism to a certain extent raises Holocaust victims to such an exalted plane (where of course they belong) that they are able, ironically, to then sweep the Holocaust under the rug. At a certain point, one that I reached a while ago, you get tired of being told what to think, how to perceive the world, and what constitutes daas Torah. The article was fair and balanced, which means that many of their readers would rake exception to it. The usual response to the Holocaust, or any tragedy, is a helpless look and then "Hashem rules the world" ( I can't figure out how to switch to Hebrew text, sorry). But sooner or later, you find that response empty, and search for others. "indeed the Torah itself openly states very clearly that God will sometimes do [THINGS THAT APPEAR TO US TO BE] extraordinarily horrible things." The Torah says no such thing. It doesn't even imply it. Horrible is horrible. If it wasn't, it wouldn't be a punishment, but that's not the point. The Holocaust was horrible, period. You seem to be making the claim that God is capable of doing evil. This of course is a fallacy. It is only evil to our eyes. Of course the Holocaust is evil, but only because we view it as such. Even you admit it was "punishment" for us. A parent punishes a child, and that child weeps tears of bitterness and sadness, but to the parent it is a greater good he or she is giving. Do you think God views the Holocaust as evil? Of course not. In his cheshbon, it was necessary, perhaps as punishment for us, perhaps for another reason we cannot fathom. But we believe that everything He does is for the good, whether that good is for us as Jews, us as humanity, or some other good we don't understand. Well, in what some see as a repudiation of Zoroastrianism (which "solves" the problem of suffering by saying that there are two gods, one good and one bad), Yishayahu says "יוצר אור ובורא חשך עשה שלום ובורא רע אני ה' עשה כל אלה". (We change the words a bit when we say that every morning.) That seems pretty definitive. If you want a more pleasant answer, there is always the famous "fourteenth principle" of the Rambam that has been suggested by some: Free will. Hashem doesn't create evil; he creates a universe with natural laws (hence earthquakes) and humans with free will (hence Hitler), and, in his wisdom, very very seldom intervenes directly in the natural order. This can mean millions of dead children. But let's not pretend it isn't evil. Saying it isn't is a hallmark of some religions, but not ours. There is a difference between Hashem doing evil and Hashem allowing evil to happen. I discussed this at length with Rav Aaron Soloveichik, zt'l. I told him that I did not believe that the million Jewish children murdered in the Shoah deserved their fate. He answered, using a Midrash Eichah (I can't remember the precise citation) that sometimes, because of hester panim, a gap is created in which evil people can accomplish their intent even though Hashem did not decree that this intent be realized. And so someone who was not necessarily supposed to be harmed may suffer: not because Hashem caused the suffering, but because Hashem withdrew His protection. Avi, that might help with respect to the Holocaust, but what about natural disasters that cause massive, horrific casualties? I saw responses by several people, describing it as "vile," "sickening," and unacceptably "judging him." Yet the article was none of that. Rabbi Feitman made it extremely clear that he was not judging Mr. Wiesel at all, and explained at length why nobody can judge him. "But we must be intellectually honest and have religious integrity in repudiating what has been published and will be read even more assiduously now that he is gone. Being in the place of Truth, he now knows what is right, and I believe he would want us to elevate his neshamah by correcting what things he needed to be mesakein, so that his neshamah can have the aliyah he so richly deserved." @R. David:"I think that in the following, Feitman judges Wiesel as not deserving of Olam Habah until those on earth (like himself) can help his neshamah correct its theological errors:"
I didn't understand the article that way: I understood it more like the idea that a person ascends higher and higher every yahrzeit, and whenever people do good deeds in his/her memory (even though Rabbi Slifkin has discussed this at length as not having a source in the Talmud, but only in later mystical literature). If he doesn't deserve Olam HaBa at all, then why does Rabbi Feitman say at the end that "his neshamah can have the aliyah he so richly deserved"? Also, there are numerous Chassidic stories (I just bought a disk which dramatized the idea, called "סיפורו של ניגון") where a righteous person is prevented from entering his/her proper place in Gan Eden until a tikkun is effected for a particular misdeed, or debt--even if it was a trifling matter. Yes, in fairness, people say "The neshama should have an aliya" all the time without implying anything about the deceased. No one's perfect, after all. But that isn't what he says. He is says that we must be "intellectually honest" to state that Weisel's writings are theologically unacceptable and know that he is "in the place of Truth" he understand his errors (heresies) and wants us to help him by correcting his errors (heresies) so that "his neshama can have the aliyah he so richly deserved" but can't get yet because of his heresy. When he says the Rambam "didn't follow the conclusion of the Gemara" does he mean that he didn't follow the Tosfos and Rashi readings and explanation of the gemara because obviously Rambam had a different approach to the text than they did. Does he also include cases where Rambam sided with the Yerushalmi over the Bavli? If we take out all the instances of stylistic differences and Talmud-to-Talmud machloket leading the criticizer to a different understanding of the gemara which Rambam didn't share, I'm sure the remaining "simply mistakens" and "forgotten sugyot" are very few in number. It was afterall a scholarly work he put a lot of time into. It would not be out of the realm of possibility that someone's magnum opus lacks more than a very few errors (or even any!) and yet at the same time that person is nowhere near infallible. When my class read Elie's book in 9th grade our rebbe brought in a fellow who is today RY in Mir Brooklyn, who criticized Weisel for not publicly doing teshuva, publicly renouncing his previous statements on god. I remember nothing positive from all his speeches to my class that yr, only petty small minded Ad hominem attacks with no alternative to offer. I studied in Boston University from the years 1987-1990. I remember how Prof. Weisel would attend our Megillah reading (the Orthodox minyan at B.U.) --he used to follow the kriyah out of his own megillah. I didn't get the impression that he wasn't religious. I remember that he said that he couldn't davven for around 5 years after the Holocaust. But he certainly participated in our minyan. Interesting, that's exactly what Wiesel did in articles and books in his later years. I have no idea if that was before or after you read his book. Yehudah: By all accounts he was certainly religious. One small thing to add: The first year that Prof Wiesel attended our Megillah reading, I asked for his autograph. But I didn't have anything for him to write on--so I suggested that he sign my Artscroll copy of the Megillah. He was shocked, "On the Megillah?!" I said, "There are some blank pages in the back." And he agreed. His shock at the possibility of writing in the text of the Megillah struck me as a reflection of his deep reverence and sincerity. I thought R. Feitman's article was fine, subject to the usual quibbles which any one has with any article, any time. What was strange was that it was written at all. R. Feitman justifies it by stating that Eli Wiesel's theology was in danger of becoming "accepted theology and hashkafa." Really? By whom? Granted that there is some degree of overlap - still, Yated readers do not get their theology from Elie Wiesel, and the types of Jews who do will not care about R. Feitman's response. General comment - I've been surprised that Eli Wiesel's death has actually registered on the orthodox world (as evidenced by this article and in general the group chats and blogs I visit.) To a far greater proportion than of the non-orthodox, many in the orthodox world had parents & grandparents who all went through the Holocaust. Thus, they (we) didn't really need Elie Wiesel to be our spokesman. In almost every shul, up until fairly recently, there were many survivors. And there is no shortage of Holocaust literature within the orthodox world. Despite this, the orthodox community did take an interest in Elie Wiesel, it seems. Perhaps because he remained close to his religious roots (in one way or another.) Anyway, intressante. I do not think that the article was "vile" but I do think that it was a continuation of the chareidi attempt to minimize the Holocaust and to sideline Medinat Israel. In a long article where he quotes virtually every thinker of the past two hundred years but you cannot find even a smidgen of discussion that maybe, just maybe, there is some connection between the Holocuast and the establishment of the medinah. Elie Wiesel a'h was married in the 'churvah' in Jerushalaim in 1969 to show his attachment to the medinah. He questioned his faith after the Holocaust but he never wavered in his support of the medinah. All of the critics conveniently live in the US. Yet the Klausenburger Rebbe zz'l build Kiryat Sanz in Israel, not Orange County, New York. R'Menashe Klein zz'l build his kiryah in israel, not Brooklyn. Rabbi Feitman quotes his translation of Rav Hutner's zz'l well known take on the Holocaust. Go read it and you will see how it is a rejection of the Holocaust and a veiled repudiation of the medinah. The chareidi world today cannot stand scrutiny on most of its holy cows. The only way to deflect this is to ignore it. Rabbi Feitman just continues in this vein. While the article by Rabbi Feitman is not vile, it is demeaning to Wiesel's memory by casting his early books (I'm thinking of 'Night') in such a negative light. If criticism of the divine governance is to be condemned, why stop at Wiesel? Why not condemn the prophet Jeremiah due to some of his utterances - particularly in Eicha, or Habakkuk (Tov ayin..)? Not only do the sages not criticize Jeremiah, they place his status above that of Elijah and Yonah since he contended for both GOD and Israel as opposed to the others who focused on one (Sifrei). Rabbi Feitman also doesn't appear to recognize the element of poetic exaggeration in Wiesel's writings. As to the possible harm to the religious sensibilities or allegiance of the young who encounter those books, that is largely negated by Wiesel's own history of loyalty to tradition. There is a current article in Matzav by Rabbi Mordechai Avigdor whose family was close to Wiesel. He relates that his grandfather, Rav Yaakov Avigdor, ran a hazardous, clandestine minyan in Buchenwald leading the tefilot and kri'at hatorah from memory. Wiesel was a participant. If he could risk his life by so doing, then he was certainly entitled to his criticism of the seeming divine absence in the horrors of the Holocaust. "But he made it as clear as one possibly can that he was disputing the statements, not criticizing the person." A couple of weeks ago Mishpacha ran a cover feature on Artscroll, and they interviewed Rabbi Sherman ( I thought that it qualified as an ad, but that's another matter). In the article, the rabbi was unapologetic for writing hagiographies of the various rabbanim. He said that the books were meant to be inspirational, not historical. Weisel, on the other hand, presents a conflicted, even tortured view of a Jew, brought up as Hassidic, confronting the murder of his parents and the destruction of everything he believed in. To require him to conform to today`s view of what is correct, and to accept only one view as valid is simply bowdlerising history and treating us all like children. In fact, not to even describe or narrate the conflicts we can all face is to make the "Daas Torah" viewpoint seem irrelevant. An interesting sidelight of the coverage of Elie Wiesel's passing is that it has been noted that he had much more influence in the US and Europe than he had in Israel. The reason for this, as I have observed, is that here in Israel, the Holocaust is a major, searing foundation stone for the whole national ethos. In the past, one ran into people every day that were Holocaust survivors or refugees, and that many of these people came out of that hell, either from the camps or from those who fought as partisans against the Germans, and who then came straight into the struggle to build and defend the state of Israel. Life was never easy for these people. Although many didn't want to talk about it with next generation, after the Eichmann trial in the early 1960's, the next generation absorbed the message. All of this has given Israelis a deep consciousness about not taking survival as a people and a state for granted and those who serve in the IDF are aware of their role in defending our people. Annual commemorations such as Yom HaZikaron for the Holocaust and ongoing discussion of it in the media keeps one's awareness of it alive. In the US, most American Jews had no direct family connections with the Holocaust, the majority of Jews arriving before the 1924 cut-off of unrestricted immigration. Thus, for most (but not all) American Jews, Holocaust memory boils down to "victimization". Elie Wiesel's books speak directly to this. American ethos today strongly emphasizes "victimization", such as for the blacks and their history of segregation or women as supposedly victims of gender bias, so Jews can feel comfortable in taking on a role as victims as well. Here in Israel, being a victim was never viewed as some sort of special status or "privilege" but (although I must confess the national custom of taking all important visitors to Yad V'Shem does seem to emphasize victimization as well) but rather as an impetus to resolve never to allow ourselves to become powerless, defenseless victims again. You can't blame a man that went through hell on earth. Everybody has a different experience in Judy's in some bad some good. He obviously the worst. Doubting is part of being human. 1) I think it is overly simplistic to cite Iyov as a condemnation of the Haredi approach to the Holocaust. There are four basic ways the problem of reconciling human suffering with an all-loving, merciful G-d, in the Tanakh. I think the reason that all four perspectives can be found is that they all reflect an aspect of reality. People who make good life choices really do have better lives, on average, but there are obvious exceptions etc. What is important for any honest person to acknowledge, though, is that the prophetic moral-blame tradition is obviously the dominant voice in the Tanakh and the one that we are repeatedly enjoined to follow even when the evidence doesn't make it obvious. I am constantly surprised by how many people can read Eichah describing people eating their babies to escape starvation and saying, over and over again, that they deserve it and then respond with gasps when someone tries to apply the same logic, however tentatively, to the Holocaust. After all, if you actually believe in Orthodox Judaism then presumably you think it was bad that the vast majority of the Jewish people in 1939 had abandoned halacha. (Similarly, if you are Zionist of any description, surely it's not too difficult to to provide a Mishlei-type explanation of the Holocaust). In my experience, one of the most obvious differences between the Haredi world (and I mean the real one, not the Anglo apologetic one) and the MO world is how much more comfortable the former is with the full breadth of the Jewish theodicic tradition. 2) Nevertheless, personally, theodicy doesn't interest me at all for some reason. I think I realised at some point that if after three millenia the problem hadn't been solved in such a way as to satisfy people, it is not likely ever to be solved, so I stopped thinking about it. A far more worrying part of Elie Wiesel's legacy, to me, is summed up in this quote. "No human race is superior; no religious faith is inferior. All collective judgments are wrong. Only racists make them." Now, perhaps I am entering into "vile" territory too, but it strikes me that the fact that Wiesel suffered enormously, exhibited great bravery and really did mean well, allowed him to spend decades propagating obvious untruths and non-sequitors, that are actually getting people killed right now. Just as importantly, for us at least, this fundamentalist anti-Nazism is the chief engine of anti-Israel sentiment around the world today. 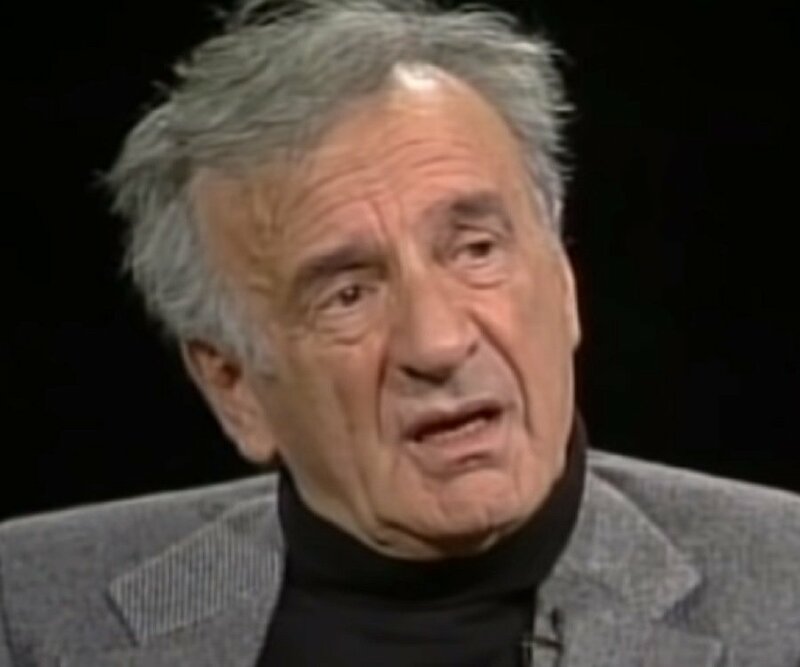 Elie Wiesel, perhaps to his credit and perhaps not, never took his fundamentalist liberalism to its logical conclusion regarding Israel, which is why in his older years he had to increasingly fraternize with "extreme right" figures, but others do. There are a million and one ways to be wrong, and myopically focusing on avoiding one way is almost guaranteed to make you fall into another. In general, it would be healthy for the world if everyone agreed to a five year hiatus on talking about the Nazis and the Holocaust at all. I went to the massive rally in Washington that was called to protest the genocide in Darfur. There were numerous "yeshivish" attendees, and I think it is fair to say that regardless of whether Elie Wiesel was a "spokesman," chareidi representation was significant.